This morning our team woke up at 5:30am to attend a local church called “Church on the Rock”. My gosh was it so powerful to witness their worship. Although it’s different than what we do in the states, the beauty is that we all worship the same God. The fact that we were all in the same building worshipping the same God even in different languages, it was all to give God the Glory. After church we walked back to the guest house to have breakfast with the team and get prepared for another day of water truck delivery. As we headed out on another water truck delivery day in Cite Soleil, these thoughts run through my head. To be in the moment and to see the Haitian people through the eyes of God and to be reminded of how similar we all are. Not just the basic need of water, but of being loved. So as we head out again with three stops, we ride in the tap tap as a group going over our strategy of filling buckets, staying in line, helping to carry buckets to homes (these are walls/roof of galvanized steel with dirt floors) we think we have this down to make the process move faster. However, we find out every stop is different. Some stops have many more children who are needing and wanting to be loved and some stops have more of a need to help carry buckets. At no point are we without buckets to carry and children to love. 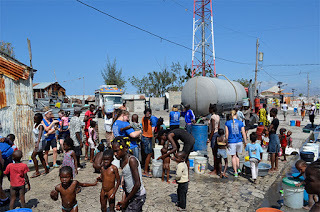 When people ask “what did you do in Haiti” it will be hard to put into words these water truck days of bringing water to people who have no running water. How do you describe the hugs, smiles, and love from the children…all I can say is that we are all uniquely and wonderfully made and loved by God the Father. At our first stop, we got out of the tap tap (our bus) and kids were all around excited to be picked up and loved. I look over and I saw another team member holding a little infant and instantly started beating faster. Here is the “big” sister, about the age of 5, carrying her little baby brother around who looked to be about 1 month old, maybe. I could hear his little cry that to me sounded scared and needing comfort. I myself have kiddos, the youngest being 5 months old so this really hit home for me. I walked over and asked to take this precious little baby and as soon as I took him, his little cry stopped. I just held him, comforted and loved him. It was so hard for me to give him back. This broke my heart so much. When it was time to head to the next stop, it was really tough on me, honestly, I broke down and just wept thinking about this little maybe 5 year old taking care of her little newborn brother. Thinking to myself “how will he get his next meal? Who’s going to comfort him? What if his sister drops him?” These are just a few of the things that wrecked my heart. I wanted to bring him home with me. On a beautiful and heart filling note, at one of our stops this child maybe around 4-5 came up to me with his arms just open desperate for me to pick him up and hold him. After I picked him up, he wrapped his arms around my neck and placed his head tucked into my shoulder and stayed there. Its such a heartbreaking and heartwarming feeling that none of us can really ever explain, it can only be experienced and felt from your own heart. This has put such a different perspective in our minds and hearts, how precious water is to these families and how to be even more present with our own children and families. To end the day we took a tap tap ride up the mountain to Fleri for pizza. Wow, who would think that you would have the best pizza ever in Haiti!! We finally got back…9:15 time for BED!